…it moved constantly. Every minute of the day, even in its sleep, it kept moving. 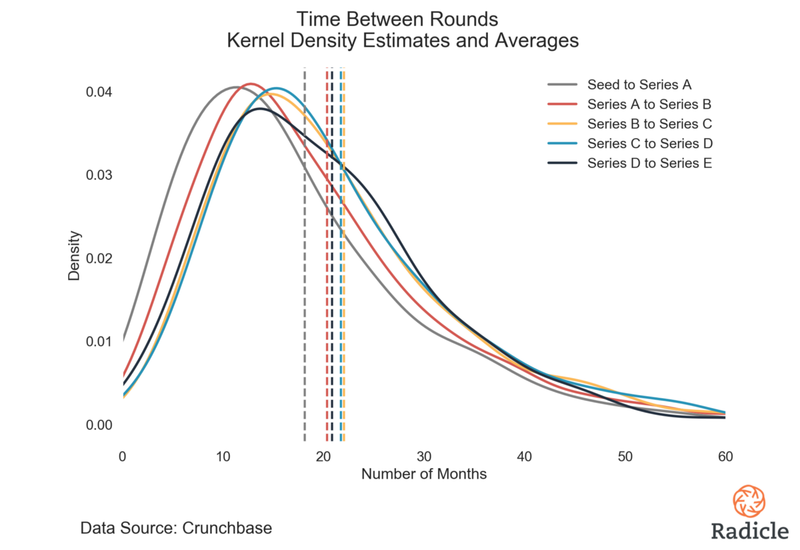 When I go and look at startups, I want to see everybody looking at triangle retention charts. I want to see the stats dashboard displayed on a big screen on the wall of your office in full view of everyone. Seeing that means that Founder took the time and effort out of his weekend to go out and get a TV and hall it up and deal with the wiring and the mounting and all the other headaches of getting it set up. It’s a sign that the Founder really loves their data. 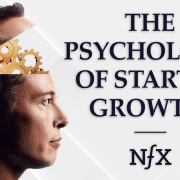 If your business is growing at 100% next year, then 90% the year after, and then about 80% the year after, the business will have grown 6.9x. That’s the way I’ve always looked at company. But this hedge fund investor said it a different way: 85% of the value of the business will be created in the next 3 years. 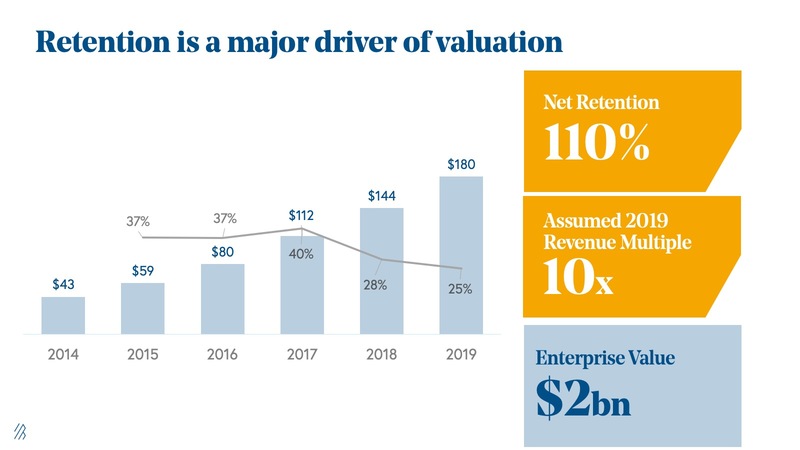 At 10% growth, the company’s value today is 77% of the value in three years. The value won’t change that much. It’s already the most of the size it will be. Same cup, same water, just a different perspective. The chart above shows how this changes with different growth rates. 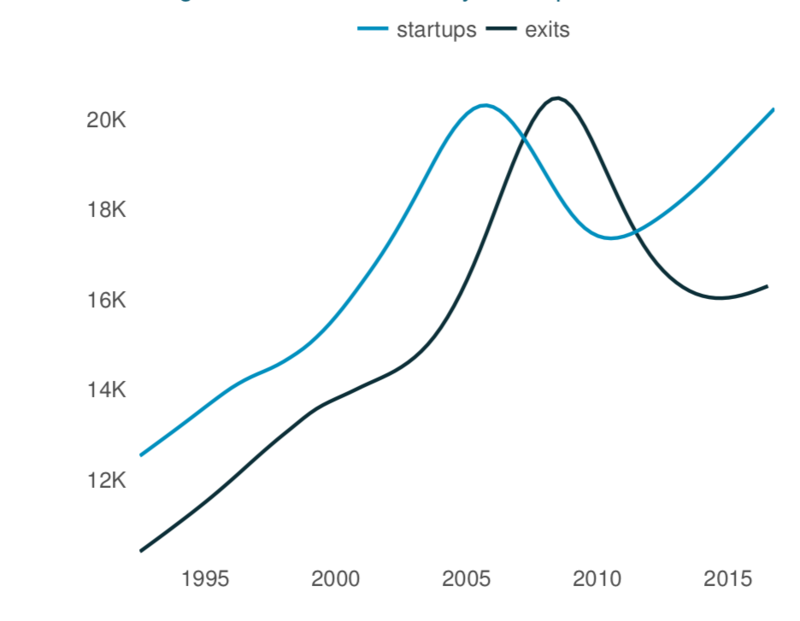 It assumes a company starts growing at the growth rate on the y-axis. 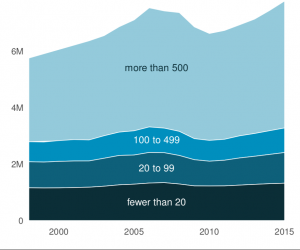 This growth rate falls 10% each year. 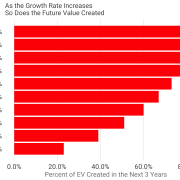 On the x-axis, you can see the fraction of the enterprise value (EV) that will be created in the next 3 years. Instead of looking at today’s valuations as a multiple of current revenues, we can think about it as a discount to the future value. This math makes that perspective concrete. When a cloud company scales it often signals the growth of others, but there are a number of other signals to the cloud sector’s velocity. 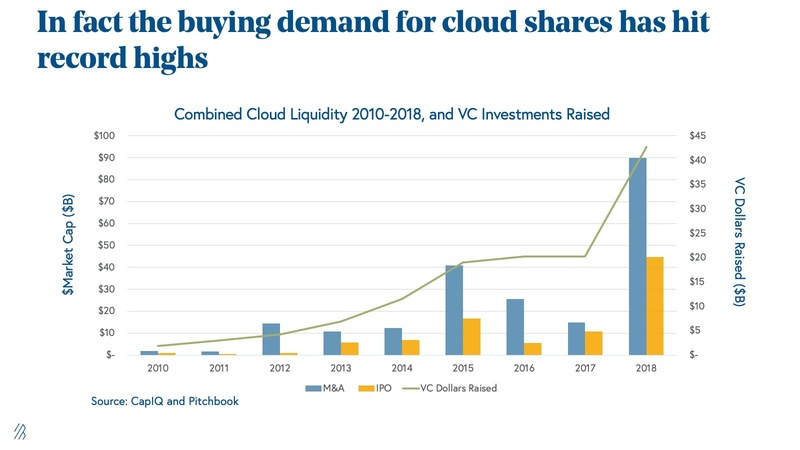 For example, this year, the demand for cloud shares and cloud liquidity hit record highs, outpacing 2015, which was the last record-breaking year. 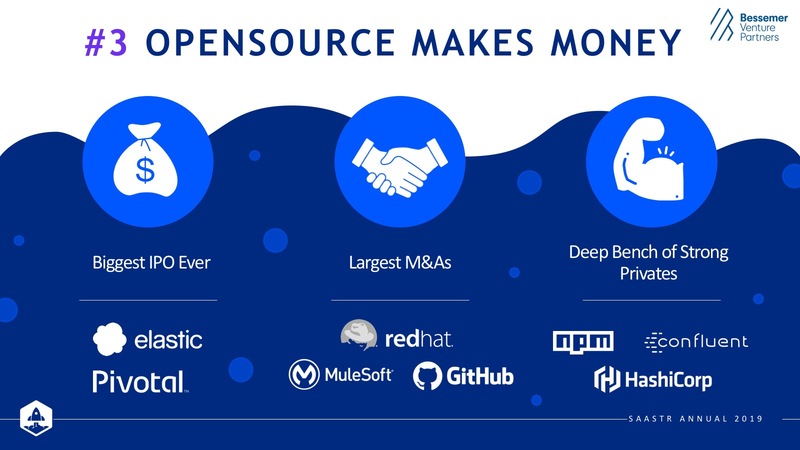 With IBM’s purchase of Red Hat ($33B), Microsoft’s acquisition of GitHub ($7.5B), and SendGrid joining forces with Twilio ($2.9B), there was more than $90 billion spent in large mergers and acquisitions. More than $50 billion was also added to the market cap through cloud IPOs, including DocuSign, Dropbox, Elastic, and Carbon Black. 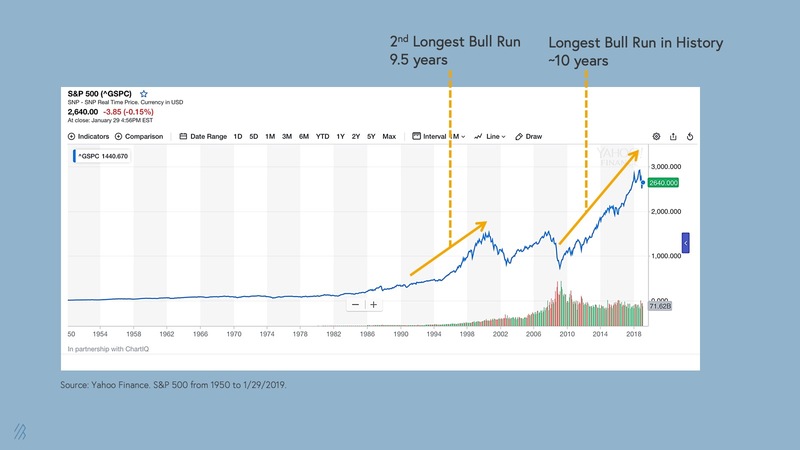 For more than a decade, we’ve had the longest bull run in U.S. history. At $175 billion, the top 100 private cloud companies have never been worth more. At this point, many founders are probably wondering how they can protect their companies from volatility. The first operational metric is annualized recurring revenue (ARR) growth. 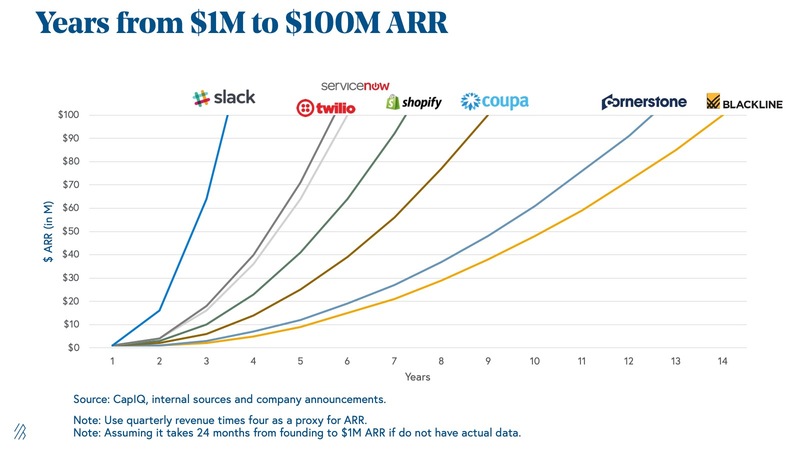 While companies such as Slack, Twilio, Shopify, and more are all considered successful in their own right, each one had their own path to earning its first $100 million in ARR. The top 25 percentile of public cloud companies spends 5.3 years on average to reach the $100 million milestone. 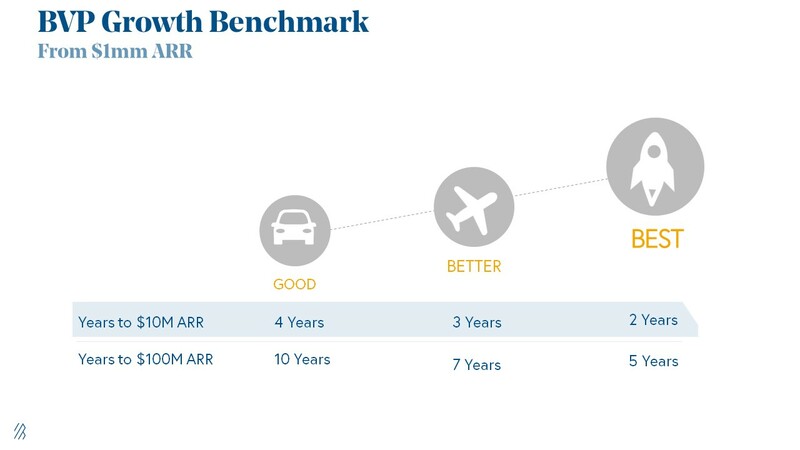 The median 50 percentile spends 7.3 years to reach $100 million in ARR. 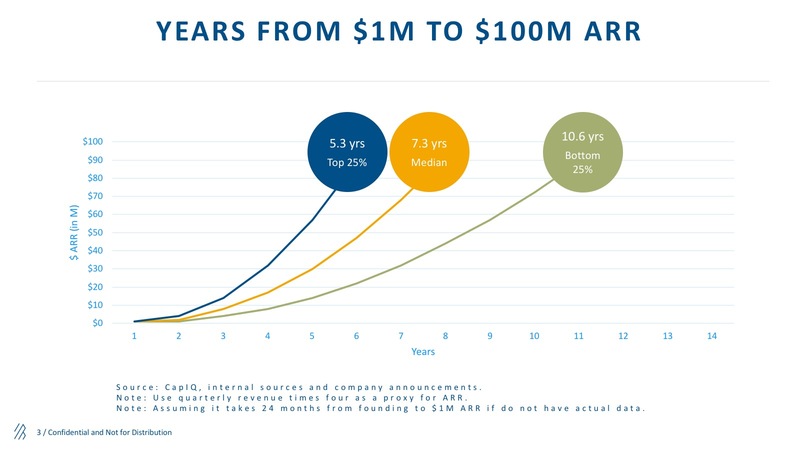 The bottom 25 percentile spends 10.6 years to reach $100 million in ARR. Enduring companies don’t just have contingency plans for when a recession hits. They set these goals and figure out how to achieve them based on the expectation that there will eventually be changes in the market. Retention, the amount of revenue accrued over a period of time, including upsells, is one of the most influential levers for cloud and SaaS businesses to pull when growing ARR. 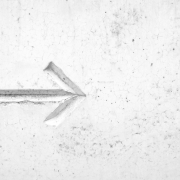 Some of the best performing SaaS businesses we’ve seen in the past decade have higher than 100 percent net retention rate because they’ve built a metered business that sells more to a customer as its business scales. However, retention rates have different meanings depending on customer segments. 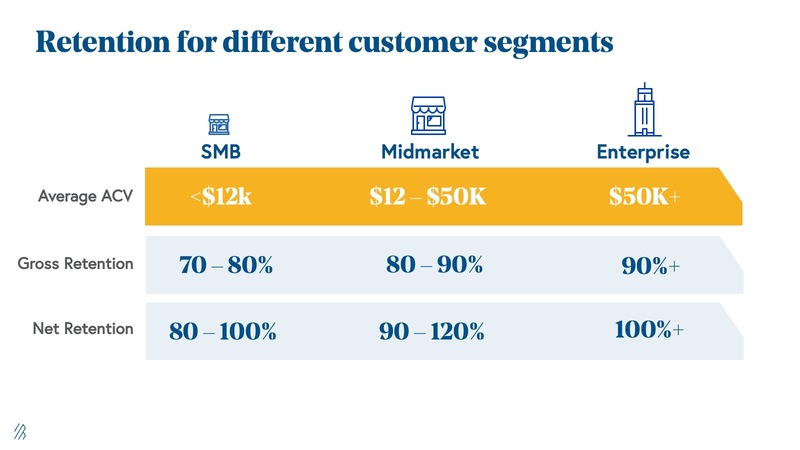 SMB customers that have an average account contract value less than $12K see a gross retention rate between 70-80 percent and net retention rates between 80-100 percent. Mid-market companies that have an average account contract value between $12-50K should aim for a gross retention rate between 80-90 percent and net retention between 90-120 percent. Enterprise businesses that have an average account contract value $50K+ should aim for more than a 90 percent gross retention rate and more than 100 percent net retention. 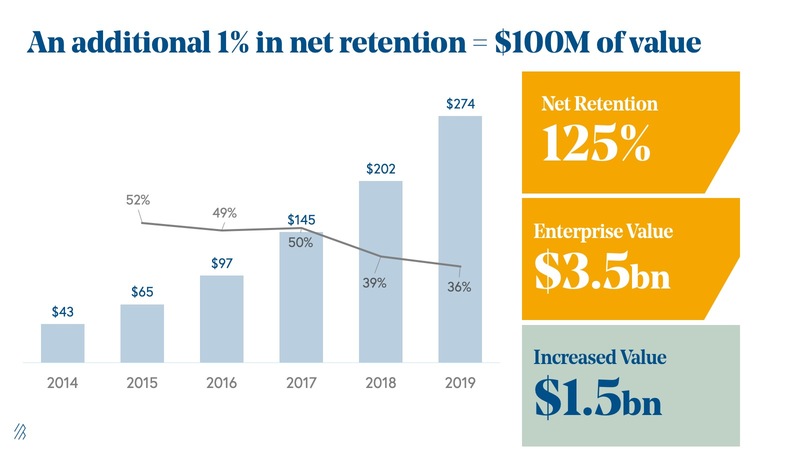 An additional one percent in net retention can increase valuation by $100 million. 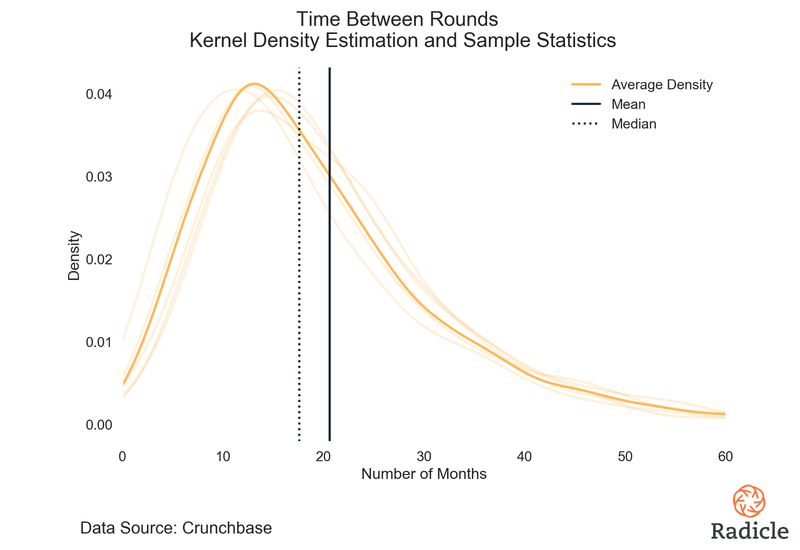 If a company’s retention rate doesn’t fit within these bands, it’s time to investigate the culprit behind the “leaky bucket.” Churn is always a symptom of larger problems. By identifying and addressing the root cause of churn, a company can directly impact top line ARR growth by just retaining its current book of business. For early-stage cloud founders, the cash you have in the bank reigns Queen (or King). Also known as “runway,” cash is the fuel to build your product, acquire new customers, hire employees, and invest in growth opportunities. Be as judicious as possible when expanding your team. 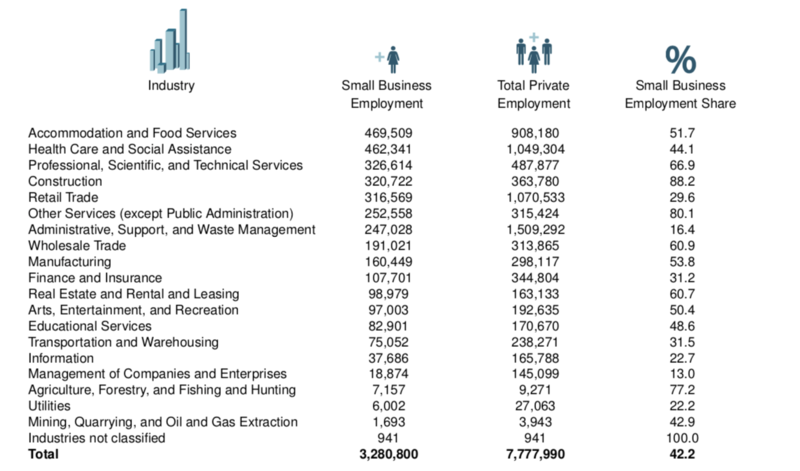 Hiring is an effective way to grow a business, but it’s also the most expensive. When in doubt, hire slow and release fast when a new team member cannot drive forward the company’s goals. 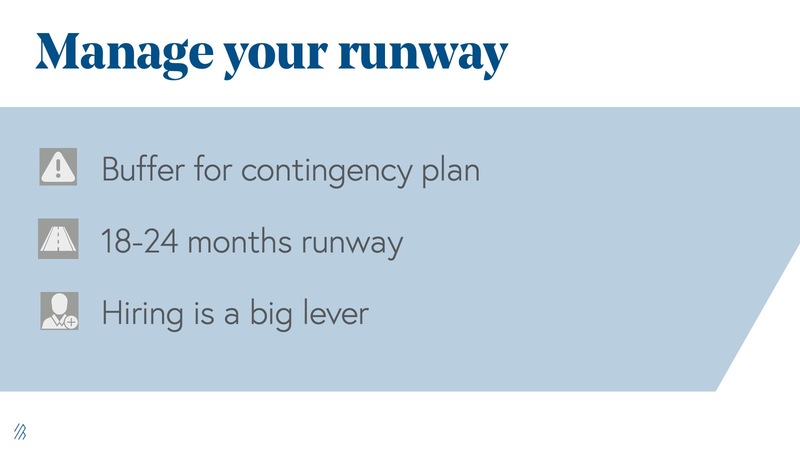 The way cloud founders allocate their runway will ultimately determine their destination. Cloud founders must always spend wisely to fuel growth. In 2017, Bessemer created a way to measure wise spending by coining the Bessemer Efficiency Score, which is defined in two ways, depending on the size of the company. 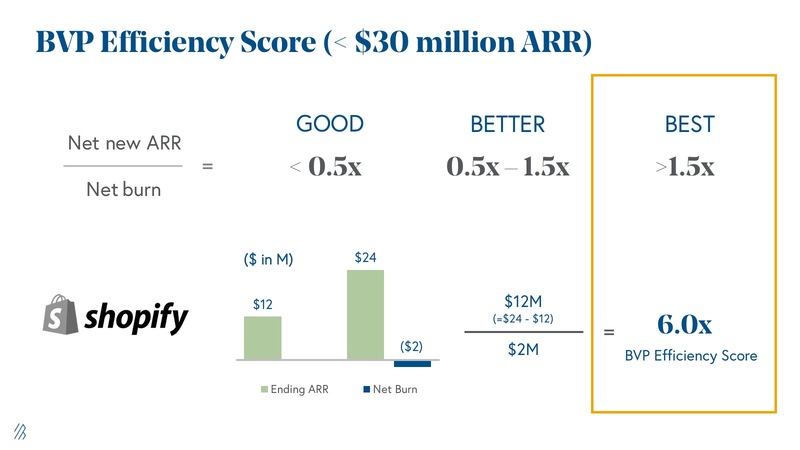 For startups earning less than $30 million ARR, the efficiency score is defined by net new ARR over net burn. In the Good, Better, Best framework when evaluating efficiency, the “best” score for a company at this stage is greater than 1.5x. This metric is different than ARR growth because it measures a company’s spending habits. It’s great if a company grows 3x, but if it’s spending crazy amounts to get there, this rate wouldn’t be considered efficient growth. In a bull market, startups can get away with less efficient growth by acquiring new customers at a higher cost than necessary. However, this approach reflects a lack of discipline and doesn’t make for resilient companies. The good news is that when you do develop more efficient businesses, they are rewarded in all markets. The G.R.I.T. 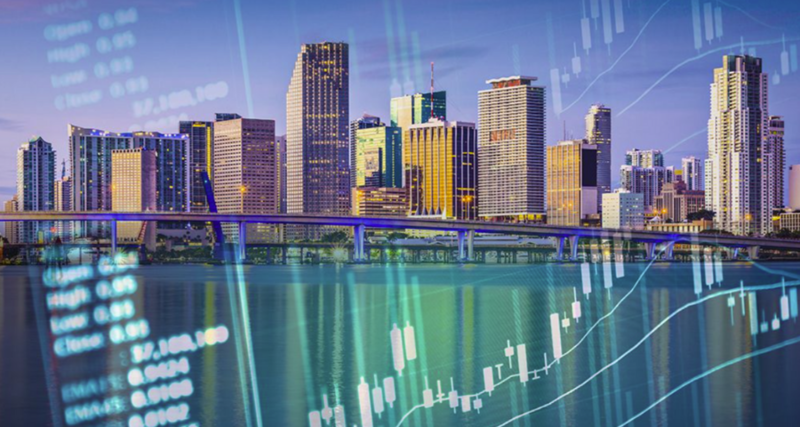 framework highlights critical metrics when evaluating resiliency. 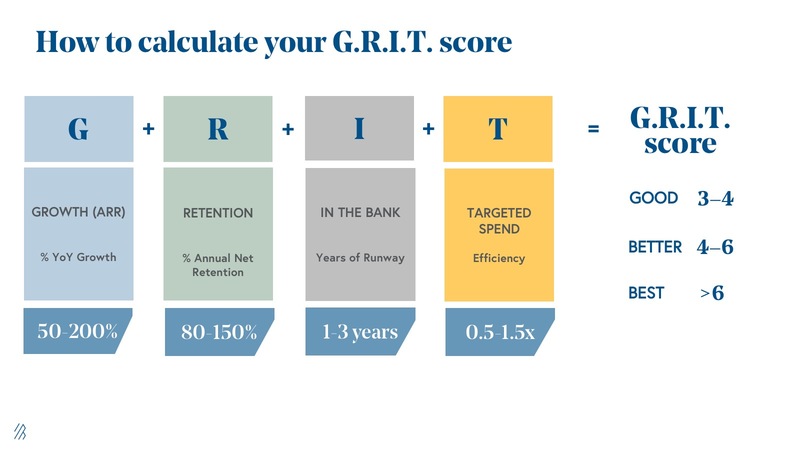 By tracking ARR growth, retention, years of runway, and efficiency, the G.R.I.T. framework also translates into an equation. Here we illustrate how to turn each metric into a variable and calculate a company’s G.R.I.T. score. Based on Bessemer’s research and the most resilient companies in the industry, we provide another Good, Better, Best benchmark so any cloud founder can see where they fall and how they can improve overtime. What’s your G.R.I.T. score? Once a cloud founder equates where they land within this framework, they’ll have a clearer idea of where their business can improve, or if it’s time to celebrate (and maintain) a high G.R.I.T. score. Since Bessemer penned the canonical laws of cloud computing more than ten years ago, our investors continue to explore how cloud businesses evolve over time and how these ten laws have aged with time. G.R.I.T. is a new framework for founders to build an enduring cloud business. A few short years ago, we predicted that the public cloud market would reach $500 billion by 2020. We were happily proven wrong when we hit the mark two years earlier in March of 2018. Less than a year later, the total cloud market cap sits right around $690 billion. Now, it’s time to set our sights on the next major milestone for the cloud industry, and see how new companies will innovate with emerging technologies. Every year at Bessemer, we share our top cloud predictions, which we believe will impact how enduring companies change the way we live, work, and engage with software. We see “robots” as the change agents of the world. 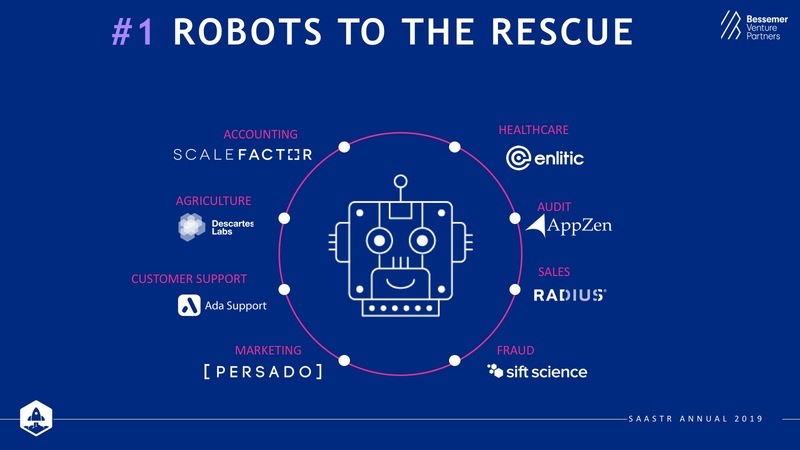 Machine learning and artificial intelligence will be instrumental technology for all the apps, platforms, and services cloud founders are building, particularly in industries where people deal with massive amounts of data like healthcare and agriculture. Robots are especially exciting when they free up human time to work on value-based thinking rather than automated tasks. We see this particularly in business areas like fraud, customer support, and accounting, with companies, such as ScaleFactor or Ada Support. Product is foundational to any software company– it’s what you build and sell. 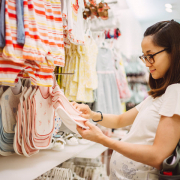 However, in the past, product teams were not the traditional, target decision-makers and buyers when businesses evaluated software purchases. They had unlimited budget for headcount, but not software. We think this may have been shortsighted. If product is the center of the organization and touches all areas of the company (sales, marketing, engineering, and customers), there should be platforms that help people manage, measure, and build the designs, plans, and roadmaps behind products. 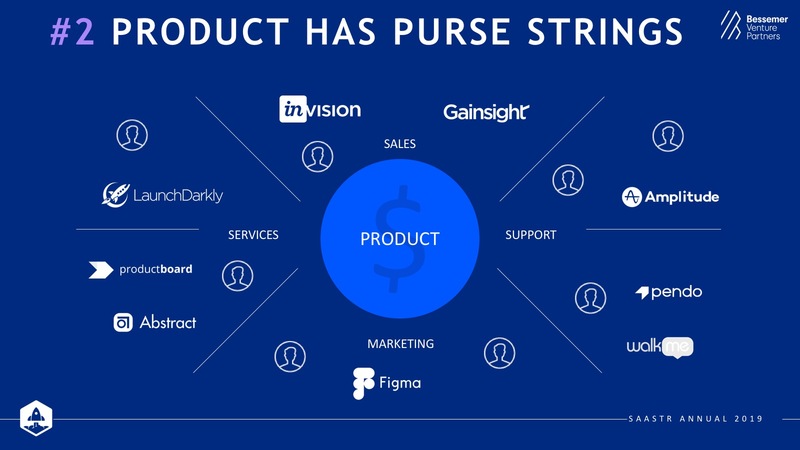 We’ve seen entrepreneurs realize this gap and build exciting tools, like Gainsight. There are many more solutions to come since product-centricity gives teams a deeper understanding of every aspect of the software, customer lifecycle, and business. Open source communities have always been beloved in the Valley – they are tight-knit, full of brilliant engineers, and at the cutting edge of innovation. 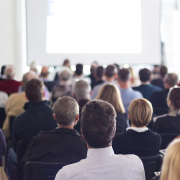 But in the past, finding commercialization or liquidity has been a challenge. In 2018, there were two record-breaking IPOs for the open source community with Elastic and Pivotal. We also had three of the largest M&As in history with Red Hat at $33 billion, MuleSoft, and GitHub. Private companies like npm, Confluent, and Hashicorp are developing and innovating open source for the enterprise. 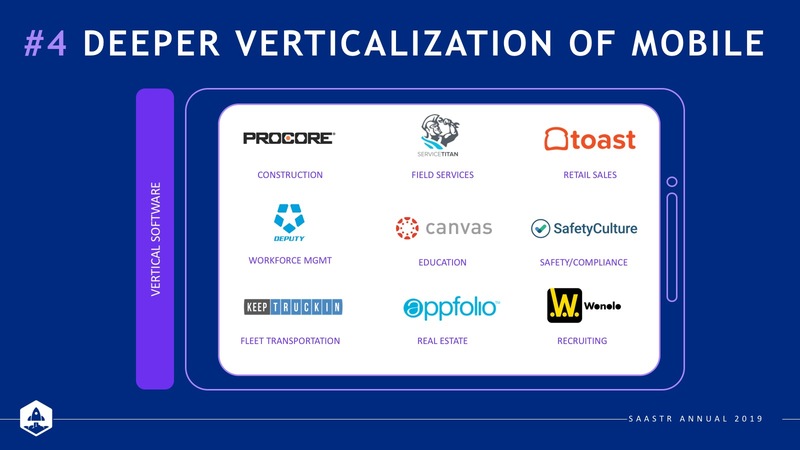 We thought the mobile channel would manifest across both horizontal and vertical sectors, but on further reflection, mobile development is progressing rapidly in vertical sectors like construction, HVAC, etc. ServiceTitan, for example, offers software and mobile solutions for businesses in field services, and their technicians. Just think about people you know and how they work. There will certainly be more deskless workers who are always on the move and need access to technology, so we expect to see significant change in the vertical category. 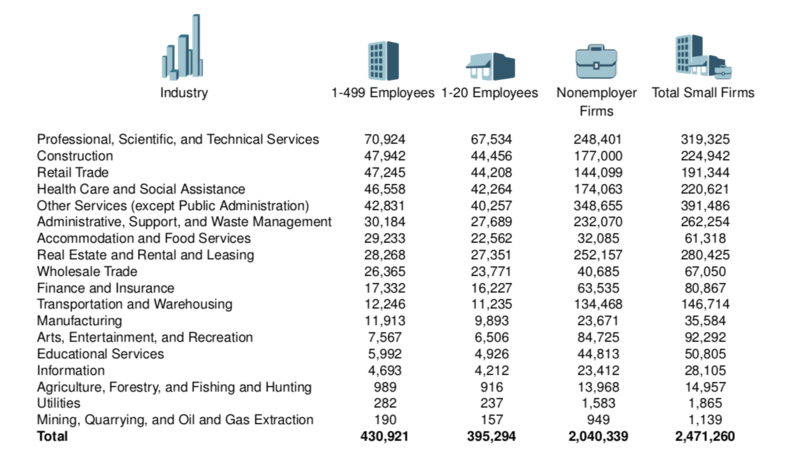 Technical roles such as product, data science, SREs, QA, and others within an organization are prime, underserved buyers. As every company becomes a software company, these technical roles will have growing budgets and purchasing power to make decisions about what types of software they want to use to help them do their jobs better. PagerDuty, for instance, makes the lives of IT Ops and SRE teams much simpler by providing a reliable alerting system to guarantee alerts are sent when needed. Periscope Data empowers data analysts to very quickly visualize their SQL queries and create beautiful dashboards. 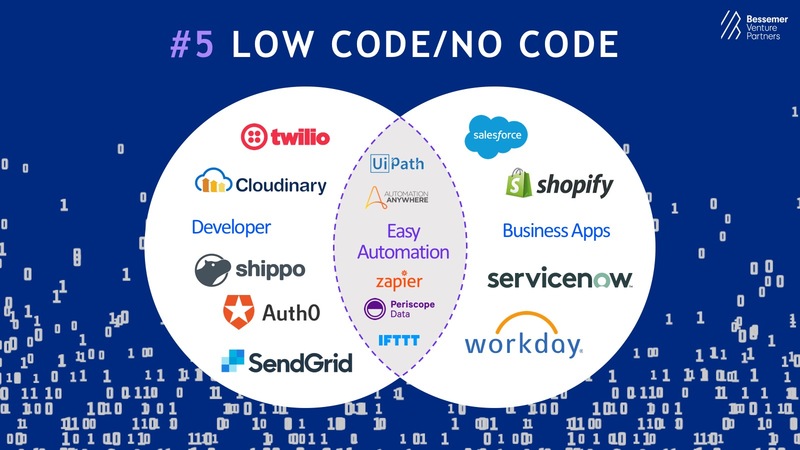 The Low Code/No Code movement will provide technologies with amazing DX (developer experience) and offload smaller tasks so engineers can focus on more complex problem sets with the help of companies like Twilio and Auth0. No code solutions also give knowledge workers powerful functionality without requiring engineering resources. This includes easy automation, such as Zapier and UiPath, and business apps within the Salesforce and Workday ecosystem. These are only five of the many trends we’re excited about at Bessemer, and we look forward to seeing how these ideas continue to contribute to the Cloud ecosystem.